Spice up your daily shower. This Croma Select S 110 vario-function handshower lets you select from Rain, Turbo Rain, and IntenseRain spray modes with push-button ease. Start out with a gentle immersive spray then switch to more invigorating modes and back again to vary your showering experience. The 4-3/8 handshower face is angled at 65-degrees from the handle for a more comfortable grip and features 79 no-clog spray channels for easier cleaning. 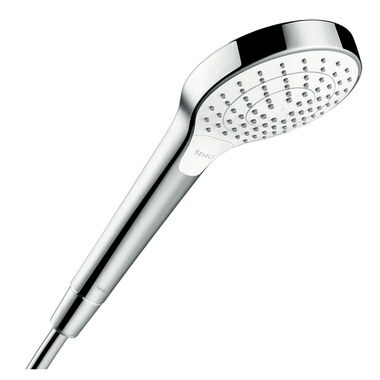 Designed for use with any shower hose with standard 1/2" threaded connections. Shower hose and holder are not included and sold separately.